"There's UFOs over New York and I ain't too surprised ..."
John Lennon wrote those words for the song "Nobody Told Me," which was released on his 1984 posthumous album Milk and Honey . The lyric was referring to a 1974 moment during his "Lost Weekend" (which was actually an 18-month period) when, in the East 52nd Street penthouse apartment he shared with his companion May Pang , he saw an unidentified, flying circular object hovering close to the terrace. Lennon was naked when he saw it and excitedly called Pang out to be an eyewitness. 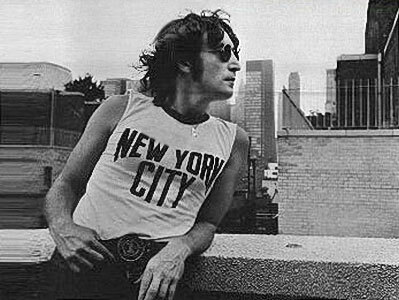 When Lennon's photographer Bob Gruen looked into it, he learned the Daily News and local precinct received other sightings that night in the same area of New York, and Lennon added this liner note to the Walls and Bridges album he was working on at the time: "On the 23rd August 1974 at 9 o'clock I saw a U.F.O. - J.L." John Lennon was born on Oct. 9, 1940 and would have turned 70 last Saturday. The event was marked with celebrations around the world, including one organized by his widow Yoko Ono at the musician's Strawberry Fields memorial in Manhattan's Central Park. Four days after crowds gathered to celebrate Lennon, UFOs were spotted hovering over New York City. News outlets went wild with coverage. One popular theory, reported on by the good folks at Ghost Theory, points to a new book by retired NORAD officer Stanley A. Fullham that predicted aliens would appear over a major city on Oct. 13, 2010. Nice prediction, eh? Not so much. It turns out the UFOs may just have been children's balloons, or balloons from a Spanish Tourism event. But honestly, although the "UFOs" were probably nothing from another world, I like my initial theory: That the aliens Lennon saw 36 years ago were popping back in to wish the Beatle a Happy Birthday, and to join in on the celebrations.